If a woman shared with you that she was struggling – in her marriage, with a wayward child, about a health concern – what would you say? If a man disclosed to you his fear of losing his job, of failing as a husband or father, or of not being able to care adequately for his elderly parents, how would you respond? Would fear of saying the wrong thing, uncomfortable feelings triggered by the information shared, or general insecurity prompt you to change the subject? This actually happened to a friend of mine, who fought to overcome her fear and finally approached her pastor, only to feel as if the door was slammed in her face. The lack of a caring response increased her feelings of shame and guilt and isolation. Failure to respond to even tentative and timid cries for help does further harm to those who are already suffering. Some people may withdraw when others share their pain, reacting automatically to protect themselves because they do not know what to say, feel inadequate to help, have experienced or are experiencing their own trauma, and/or carry their own burdens of guilt and shame. They may also assume – perhaps mistakenly – that they are being asked to fix the problem that has been named. Even those asking specifically for assistance or advice need connection above all else. Just to know that someone understands what we are going through - and does not judge or blame us for it - is a powerful key to healing. Confessing our fears, mistakes, weaknesses, and vulnerabilities lifts an enormous burden from our shoulders, especially when met with acceptance, understanding, and grace. How can the church train disciples of Jesus Christ to respond helpfully to those who suffer? First, we need a clear theological understanding of the human experience. Christian faith does not guarantee freedom from suffering or an easy life, but promises only that whatever happens, God is with us. A Christian community can serve as the living manifestation of that promise, standing with those facing difficult challenges, providing practical, spiritual, and emotional support. Sound Christian preaching and teaching equip disciples with the understanding that "rain falls on the just and unjust" (Matthew 5:45), that in this world we will have tribulation (John 16:33), and that God is with us whatever befalls (Psalm 46:7). Prayers of confession during worship often express our reluctance to accept and respond effectively to life’s challenges. Worship leaders may, in their prayers, name the trials people face (worry, health concerns, parenting, elder care, employment, disappointment) and may also acknowledge “unspoken” prayers. Naming something is essential to dealing with it. When trouble comes, even those of us with realistic expectations about life may crumble under the weight of disappointment and grief. When life doesn't go the way we want it to, we can either let dark emotions control how we handle the situation or seek the support we need to help us do the best we can under the unwelcome circumstances. If the theological and emotional climate of a faith community emphasizes and nurtures shame, people will believe they must hide their struggles. When churches encourage judgment and self-righteousness, they add to the burdens of those who suffer. A church that accepts human frailty and focuses on grace, however, will more likely free people to acknowledge both their pain and their need for support. Teaching and practicing empathic listening and loving kindness enhances the healing ministry of a faith community. Empathy empowers us to be with those who suffer, as opposed to feeling sorry for them without really connecting. An empathic comment, acknowledging what the sufferer may be feeling, is often the best, most healing and helpful response. Sufferers who feel listened to and understood may experience healing and peace, allowing them to more effectively explore options for coping. We make those who suffer feel worse when we imply that they should not feel as they do, that they are demonstrating lack of faith, that they have not prayed hard enough, or - harshest of all - that they have somehow brought this on themselves. Even well-intentioned assurances such as “God never gives you more than you can handle” or “God has a plan…” may be perceived as cold and unhelpful. Any statement that begins with “at least” will probably seem to minimize the sufferer’s pain. Trying to convince people that what they are experiencing is not so bad may only increase their sense of isolation and stimulate efforts to prove to you the depth of their pain. Start by acknowledging the feelings, even if you have to guess what they might be, and reassure those going through hard times that God loves them, that you love them, and that you will journey with them no matter what and/or help them find others to do so as well. 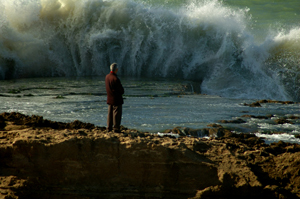 The following resources offer insights and guidance for facing the storms of life. For help dealing with specific challenges, see "Ministering with Those in Crisis and Transition" under "Best Practices Articles and Recommended Resources" at www.marriagelovepower.net. The Will of God: Answering the Hard Questions by James C. Howell (Westminister Press, 2009). The author, a pastor and theologian, considers issues relating to God’s will: how it is known, how it is done, and how we can respond when bad things happen and we feel abandoned by God. Each of the nine chapters includes discussion questions for individual or group use. The Will of God by Leslie D. Weatherhead (Whitmore and Stone, 1944). During World War II, Leslie Weatherhead preached five sermons on the will of God at City Temple in London. These sermons became a classic book that has helped grieving persons better understand the meaning of the phrase and of God’s intentions for us. The five chapters address “God’s Intentional Will,” “God’s Circumstantial Will,” “God’s Ultimate Will,” “Discerning the Will of God,” and “In His Will is Our Peace.” The book is still available in hardback, paperback, and Kindle versions, and a six-week workbook study (Leslie Weatherhead’s Will of God Workbook by Rebecca Laird (Abingdon Press, 1995), is also available to help persons understand and apply these concepts in their lives. The workbook includes the entire contents of the original book, plus three case studies illustrating the hard questions that arise in understanding the will of God. This workbook also includes a “how-to-use” section and exploration. Treasures in the Darkness, Letting Go of Pain, Holding on to Faith by L. Lawrence Brandon (United Methodist Publishing House, 2013). After losing his oldest son in a senseless killing, Bishop Lawrence tried to bury his pain and continue his life and ministry. It was only when he stopped, admitted his crumbling faith, and sought God anew that he was finally able come through the darkness to a new place of faith and joy. Blending Scripture with his own story and the stories of those he encountered, he helps readers deal with their own frustration, anger, and pain and truly grieve. Then he shows how to find the “gift of treasure” in the darkness and begin to heal and grow in relationship to God, who is always present. What Doesn’t Kill You Makes You Stronger: Turning Bad Breaks Into Blessings by Maxine Schnall (Da Capo Press, 2000). The author describes three principles for transforming adversity: (1) Embrace misfortune as an opportunity for transformation; (2) Reframe loss as possiblity; and (3) Let go of who you were and become more of who you are. Through stories of persons who have survived various hardships, large and small, and exercises to help readers shift their way of thinking about their experiences, she provides inspiration and guidance to those seeking to recover from loss and disappointment. When Bad Things Happen to Good People by Harold S. Kushner (Random House, 1981). Years after the death of his son from a degenerative disease, Rabbi Kushner wrote this clear, consoling, and profound response to the question, “Why, God?” This book became a classic that still brings comfort and hope to millions of readers.